Educate for Service first appeared on a slate board in 1915 on the chapel wall in Rider Memorial Hall. Years later, the trustees officially adopted the phrase as the College motto. "Educate for Service" expresses our belief that the pursuit of knowledge is most noble when used to benefit others. Worn by the president at formal ceremonies, the College Medallion was handcrafted by Lancaster County native Valerie Jo Coulson of silver, gold and stone inlay from one piece of petersite. The medallion incorporates the Lamp of Learning, the words Deus Lux et Veritas, the College motto "Educate for Service," and the founding year (1899) of the institution. The seal of Elizabethtown College evolved during the early years of the College. It appeared in its present form as an illustration on the cover of the Elizabethtown College Bulletin in 1928. The seal incorporates the Lamp of Learning, the College motto ("Educate for Service"), and the words Deus Lux et Veritas. It is used on official College documents. In the late 1930s, upon the recommendation of Ira R. Herr, the student body selected the "Blue Jay" as the name for the College athletic teams. The Blue Jay was chosen because of its blue and gray coat and, most importantly, because of the nature of this fighting, scrappy bird. Later, the Blue Jay became the College mascot, and today is featured on the athletic logo. Jennie Miller Via, former head of the music department, wrote the alma mater in 1921 for the College Male Quartet. Thy glory through the land. While we thy name extol. We love thee ever, oh E.C. And thy colors Gray and Blue. A memorable event in the fall, this candlelight ceremony and procession is part of the new student orientation program. It signifies the official entrance of the new class into the College community. This annual event marks the start of the academic year. The ceremony normally includes an academic procession of faculty members and administrators in regalia and an address by the president of the College or a guest speaker. One of the highlights of fall orientation, the First-Year Walk is intended to help new students get acquainted with one another. This unusual and well-remembered event is sponsored each year by Student Senate. In keeping with the College's "Educate for Service" motto, students, faculty and staff go "Into the Streets" of surrounding communities to perform service-learning projects during one weekend every fall. Members of the campus community paint walls in public parks, rake leaves for senior citizens, clean up local creeks and teach children a variety of skills, such as surfing the Internet, speaking a foreign language, etc. 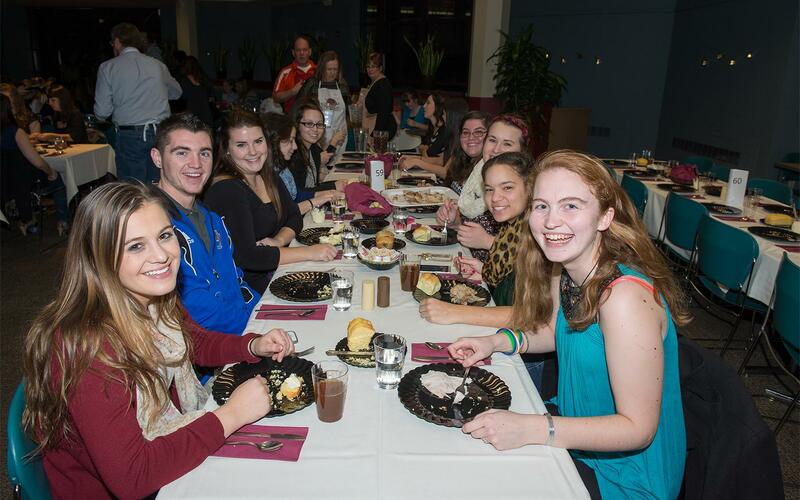 During Homecoming Weekend in the fall, alumni return to their alma mater and parents spend time on campus. Weekend activities include nationally known performers, sporting events, the presentation of the Homecoming King and Queen, social events, academic department reunions, picnics and dinners, and a flea market on the Midway. In April, "Thank Goodness It's Spring" Weekend celebrates the arrival of spring. Sponsored by the Office of Student Activities, the weekend includes outdoor games, activities, and musical performances. 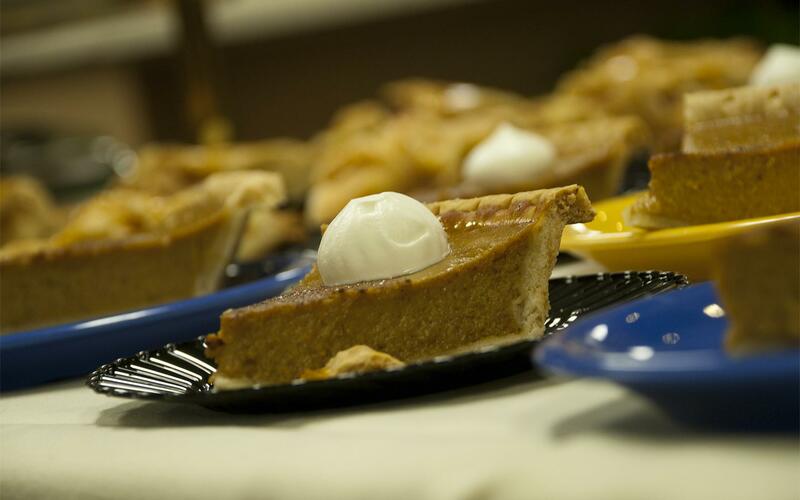 There is also a festival held on Brinser Field consisting of a wide assortment of food and dessert. 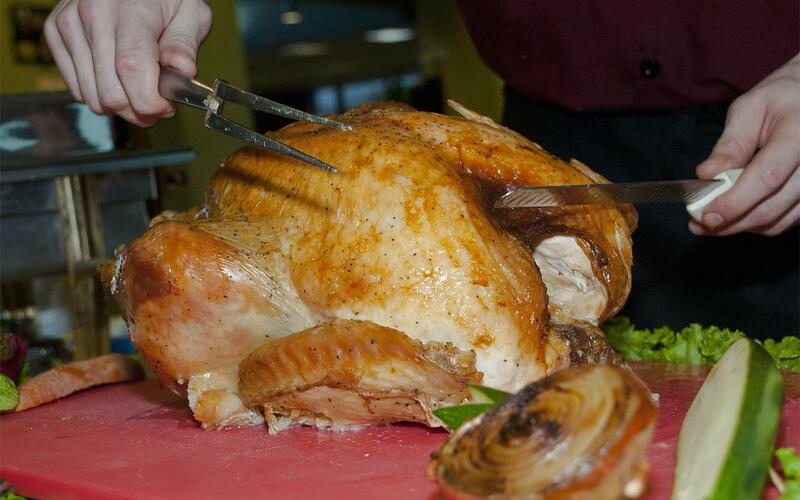 Prior to the Thanksgiving break, the College's Dining Services staff prepares a holiday feast for students, which is served by members of the faculty, staff and administration and College alumni. 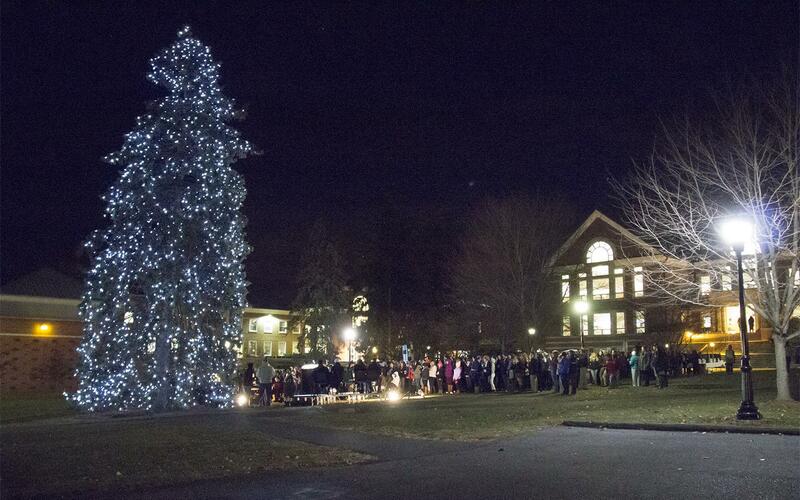 Following the dinner, the campus community joins together to celebrate the upcoming holiday season with the Tree Lighting ceremony sponsored by Student Senate. 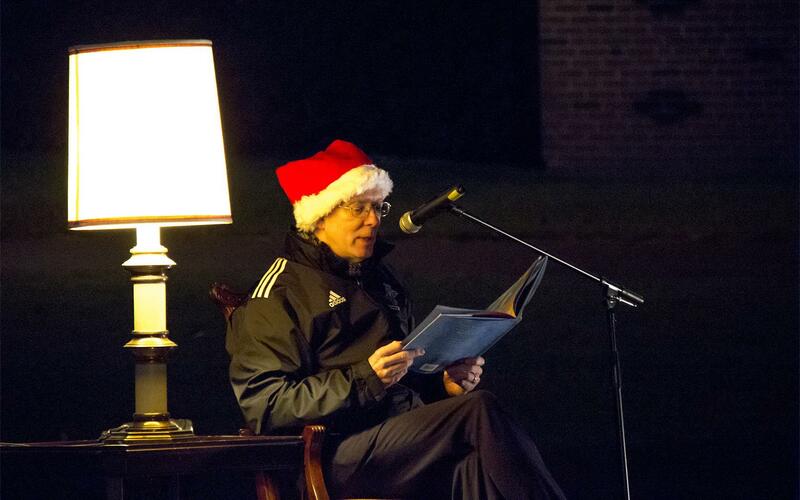 The event includes hot chocolate and cookies, a Christmas story read by President Strikwerda, and Christmas carols. Planned by the senior class officers, this candlelight service held in Leffler Chapel and Performance Center the night before commencement celebrates the past four years and the graduation of the senior class. The service includes reflections from graduating seniors and the passing of the flame from the senior class to the junior class officers. At the end of the spring semester, Commencement is held in The Dell. The ceremony includes an academic procession of faculty, administrators, trustees, the 50th-reunion class, and graduates in regalia. Honorary and earned degrees are conferred by the President of the College. Alumni who have distinguished themselves in intercollegiate athletics at Elizabethtown College are eligible to be inducted into the Ira R. Herr Athletic Hall of Fame. The annual induction typically takes place at the Blue Jay Athletics Alumni Reunion in May. Ira Herr (1894–1986) was the first coach and athletic director at Elizabethtown.